Krauter Vesuvius – Shot Hole? We've been struggling to save our two Krauter Vesuvius trees since they were first planted. I believe we have two problems: shot hole disease and aphids. At one point I treated the plant with an insecticide/fertilizer mix and it did well for a while. A lot of new growth appeared, but since then that new growth has either fallen off or resembles swiss cheese. The leaves have purplish dots and holes, which makes me think shot hole. They look so sad in our yard right now and I really would like to be able to save them. Is it going to be possible? 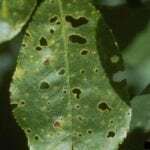 Should I try the insecticide/fertilizer mix again and also treat the trees with fixed copper fungicide? How do I prune if all of the leaves look affected?